MN United’s Nick Rogers (L), Mayor Chris Coleman and Dr. Bill McGuire (R) supervised a crew of youth soccer players who broke ground on the new soccer stadium in St. Paul on Monday. 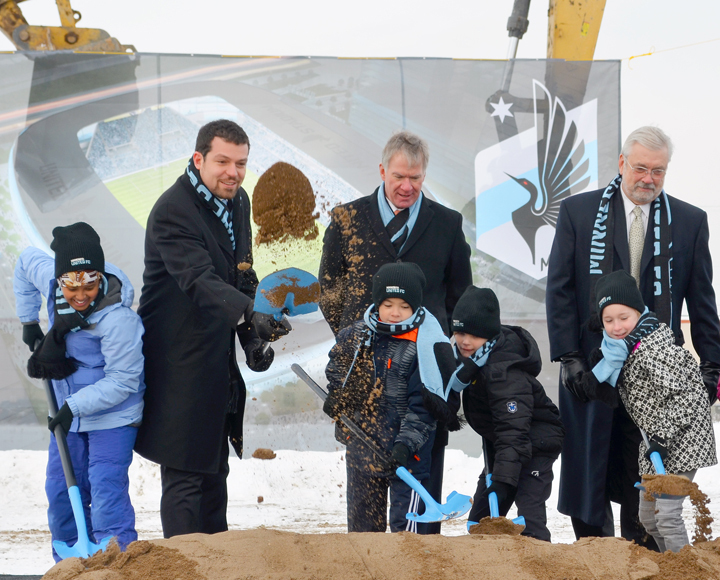 Youth soccer players and local dignitaries sent dirt and snow flying during a ceremonial groundbreaking Dec. 12 for the planned 20,000-seat pro-soccer stadium in St. Paul’s Midway district. The $250 million construction project remains in the early, exploratory stages, and snarls remain both at the Capitol, where lawmakers must sign off on a property-tax exemption for the stadium, and in acquiring nearby property, including a shopping center that houses union-staffed Rainbow Foods. But developers hope to begin work in earnest next spring and, potentially, host games in 2018. Don Mullin, executive secretary of the St. Paul Building and Construction Trades Council, said a project labor agreement (PLA) covering construction work already has been negotiated. PLA’s establish terms and conditions for construction employees and contractors on a project, from wages and benefits to overtime pay, grievance procedures and more. By setting terms and conditions at the outset, project owners make their labor costs more predictable, weed out irresponsible bidders and ensure labor peace with local unions for the entirety of the project. Several studies show projects built under PLAs are more likely to be completed on time, within budget and with quality construction. Planning models show the stadium oval extending north from I-94 toward University Avenue, a configuration that would require acquisition of land owned by Midway Shopping Center and other retailers. The largest is Rainbow, which employs 45 members of United Food and Commercial Workers Local 1189. Bernie Hesse, Local 1189’s director of special projects, said he doesn’t expect land-acquisition negotiations to prevent construction of the stadium, but he warned of an expanding “food desert” in the area if the development squeezes out Rainbow. “Let’s not marginalize these workers,” he said.